Please find details of upcoming courses HERE. Description - The Make It Happen is a 6 hour long course which aims to give candidates the skills needed to facilitate fun and engaging basketball sessions. It is designed to teach candidates how to develop physical movement skills, technical skills and build basic tactical understanding by using games based coaching. It will also give the candidate the knowledge and ability to Game Coach (A new term introduced at the early stages of basketball to replace the referee). This course is suitable for anyone wishing to gain a foundational understanding of coaching and officiating or a better general understanding of the game. Cost - This course costs £275 as a standard rate. For this price you can put up to 24 candidates on the course. There is no minimum number of candidates however the price remains at £275 regardless of how few candidates attend. You will be expected to provide a facility for 6 hours, ideally with access to both classroom (with projector) and a court. Cost - £102 subsidy price. £170 full price. Course lasts 2 full days or 4 evenings. Candidates must be 16 years old or above on Day 1 of the course. Cost - £140 subsidy price. £350 full price. Course lasts 5 full days over 2 months or more. Candidates must be 18 years old or above on Day 1 of the course. Subsidies will be applied for by basketballscotland on behalf of the applicant when they sign up to the course. Candidates must sign up at least 4 weeks ahead of the course taking place in order for subsidies to be applied for. If you are a club or organisation and have enough candidates to fill a course (minimum 10, maximum 16) you may request a closed course. You must request a course at least 2 months before the first day of the course. 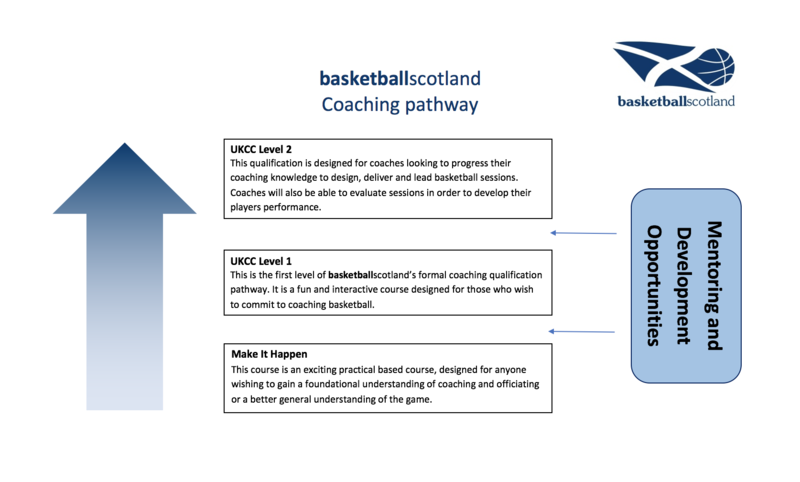 You will be responsible for finding and paying for a venue to host the course and basketballscotland will provide tutors and make the subsidy application. You can request a closed course HERE. Please note this is simply a request and not confirmation of a course booking.